My friend’s Westie rescues enjoyed the infamous Pedestrian Bridge in Downtown Nashville during last week’s snow. Baxter and Brody make the best snowdogs. Luckily, our Brentwood backyard has a slight slope. 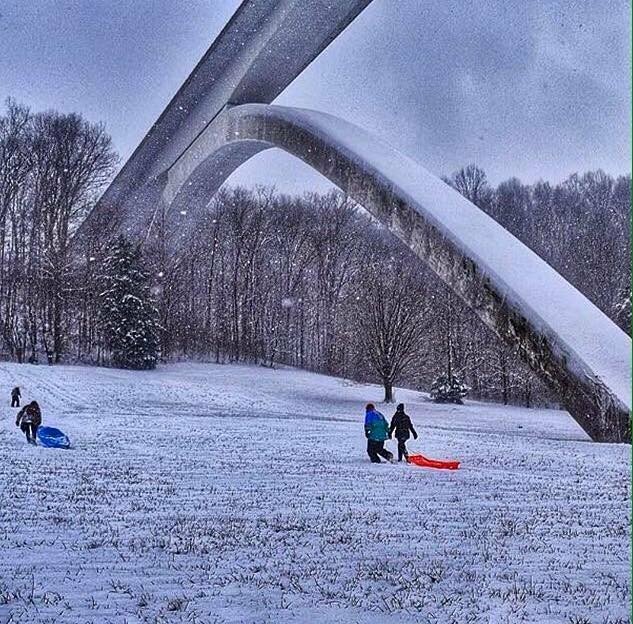 There are tons of great sledding hills all around town. What Nashvillians can all agree on is that we experience four seasons. Four glorious seasons, sometimes short, sometimes long, but we get ’em all: winter, spring, summer, fall. For that, I am thankful. I would miss one without the other. Expect Kroger, Publix, Wal-Mart, et al. to be busy if any bad weather is predicted. Bottled water could be sold out. We like to be prepared. Tornadoes. Yep, I have heard that ‘Tornado Alley’ has shifted putting our area at greater risk. And I’ve been glued to the TV –ready to hop my family into our safe place –enough times to take this seriously. Our local media, however, does an excellent job tracking and keeping us informed. Floods: The 2010 Nashville flood was a 1,000-year epic event, which has a 0.1 percent likelihood of occurring (according to the National Weather Service). Not likely to happen again in this lifetime. Yes, our August is typically a hot, humid month. But not untolerable. It’s short lived. And worth tolerating for the other glorious seasons. Interested to hear what ya’ll think about Nashville’s climate? How do you spend your snow days? And how do you like our dog that doesn’t bark– compliments of Jonas? Enjoyed reading your post! Also, great weather advice for people looking to relocate to Nashville. I think Nashville has a great climate — nothing too extreme one way or the other.